The end of 2012 was a period of intense travel. On Friday, 16 November I went to Swaziland for the Waterford Governing Council meeting. There was also an event to say goodbye to the headmaster, Laurence Nodder who left after 14 years at the helm. He has a really exciting new position, starting a school in Germany. The farewell dinner was held at the home of the Italian consul in Swaziland. I’m not sure if this is because they love cooking or need to make a bit of extra money. It was a time of reflection. I was one of the first Governors to meet Laurence in 1998. At the time we were desperate to find a head to get us out of terrible financial hole and lead the school in a new direction. The tributes to him and his wife Debbie have been posted on the school website and are well deserved. On the Sunday I flew up to Johannesburg and then on to New York. This is a nonstop flight and takes over 16 hours. We left at 8:30pm and got in at 5amlocal time on Monday. I watched two movies on this flight. First Finding Neverland is the story of JM Barrie and Peter Pan. The cast included Johnny Depp as Barrie and Kate Winslet as Sylvia Davies and Dustin Hoffman. It was moving and informative. The second, a just released film, The Magic of Belle Island, starred Morgan Freeman as an alcoholic, disabled writer who moves into a house next to a divorced mother and her three daughters. I had to watch the last five minutes on the return leg; my neighbour started talking just before we landed. I attended Aidspan Board meetings on Tuesday and Wednesday and flew back to Durban on Thursday evening, arriving at midday on Friday. That was an excellent flight as the plane was virtually empty. We left on American Thanksgiving and no one else was traveling. I spread myself out, managed to do six very productive hours of work, sleep for about the same amount of time and got into Durban feeling reasonably refreshed. The advantage of such a short trip is that one does not have to deal with jet lag. I spent the Saturday in the office, meeting with Samuel Gormley, HEARD Operations Director, to catch up. Then on the Sunday it was back to Swaziland for a conference. The meeting was a ‘Cross-Country Ministerial Consultation Workshop on Health Financing’ organised by the Clinton Health Access Initiative (CHAI). I flew to Joburg and drove from there. There were no seats on the flights in or out of the country because of the event. I do normally very much like the drive! However, unfortunately there was thick fog for over 100 kilometers. The CHAI began in 2002 with a focus on AIDS and health systems in resource-poor countries. It has expanded to include treatment for malaria, accelerating the rollout of new vaccines and lowering infant mortality. It has a presence in, and partners with the governments of 25 countries. I presented in a special session: Spotlight on Swaziland. This gave an overview of the HIV and the health financing situation in Swaziland, and how the country has done in light of being faced with incredibly high HIV prevalence and a challenging fiscal environment. The meeting had high quality presentations packed with information and data. It will take time to digest. So big plans? I have completed the medicals for moving to Canada. This is quite a process involving x-rays, blood and urine tests as well as a physical examination. As part of this process the doctor, who is the only one in Durban certified to carry out these medicals, determined that I have elevated blood pressure, and put me on medication. This means I now am experiencing the process of being on drugs for the long term. All was well, apart from the BP, and the papers have been granted. I will travel to Canada in the second week of January to complete the formalities and actually get on the pay roll at Wilfrid Laurier University. It is all very exciting and, if I am honest, scary. I really am moving out of my comfort zone. A new country, new job and driving on the right hand side of the road. One of the real pleasures in Durban is the fresh fruit. In the two weeks I was away from the city in November the fresh fruit for 2012 arrived. There are plums, grapes, watermelons, mangoes and litchis. I always buy Victoria plums, dark red ones. One of the first things my mother did when we moved into our house in Swaziland, was to plant fruit trees. In fact she may even have done this before we took possession of the place. We had oranges, lemons, grapes and two plum trees. Whenever I bite into a plum I am immediately taken back to picking them off our trees in December every year. Sun warmed and sweet. I ate so many grapes one year and developed an allergy to that particular variety: Katoba. The one failure was a quince tree which, in 10 years, produced only two quinces. The end of November is exam time at the University and there were notices on the campus inviting students to attend the pre-exam prayer meetings. I am not certain what form divine intercession would take: presumably for those who have studied it is that they are articulate and calm. For those who have not, who knows? 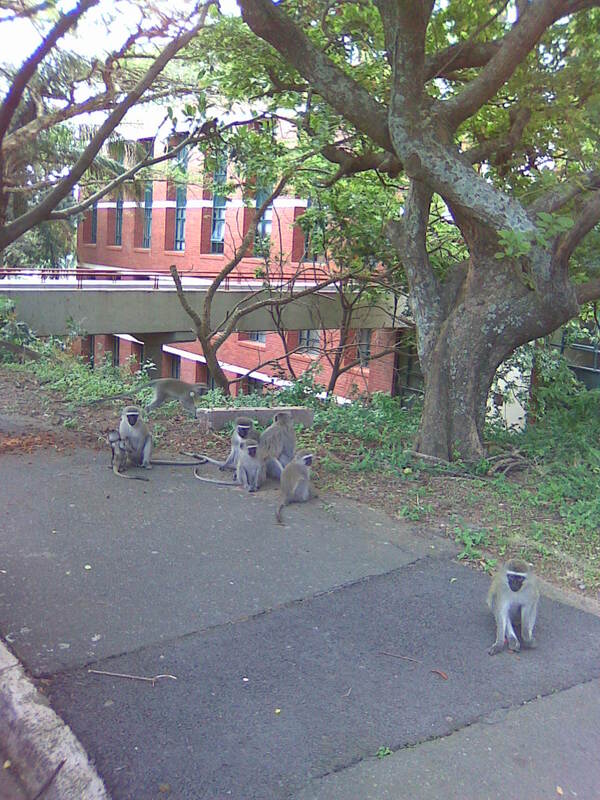 With the departure of the students the troop of monkeys that hang around the campus have become more aggressive. The reason is that there is not as much waste food. They have even been bold enough to come up to the fourth floor and steal food from our offices. This has caused much hysteria. Interestingly they are more likely to mug females, and the women working for HEARD are made quite nervous. One (of the women) was in the office when the animal came in. There have been notable departures in 2012. The owner of my Durban gym, Auguste Gant died in December. He was a magnificent old man, born and grew up in Egypt, had a passport from Luxembourg and immigrated to South Africa as a young man. I went to his funeral in a Catholic church where mass was celebrated. On the shelf in front of us were guidelines as to who could take communion, and how they should do it. The answer, by the way, is only Catholics. There was, however, a PS on the notice which I have to share: “The Eucharist is always received from a minister. Holy Communion Is not a ‘self-service’ action. Communicants, therefore, should never attempt to ‘dip’ the sacred host into the chalice”. Cosmos Desmond, one of the struggle heroes, died in March. He trained as a Catholic priest but left the priesthood, married and had three children, one of whom worked at HEARD. There were a number of obituaries. Both were deaths mourned but lives celebrated. I fear the year ended with another, unnecessary, HIV related death in my neighbourhood, but don’t have enough information to be certain yet. It has been an extremely successful year for HEARD. A quick count in mid—December showed we have at least 36 peer reviewed publications, journal articles and book chapters, and the count may go up. This means the output is over three per research staff member, which is outstanding. The communications team has been excellent, evident from the website. 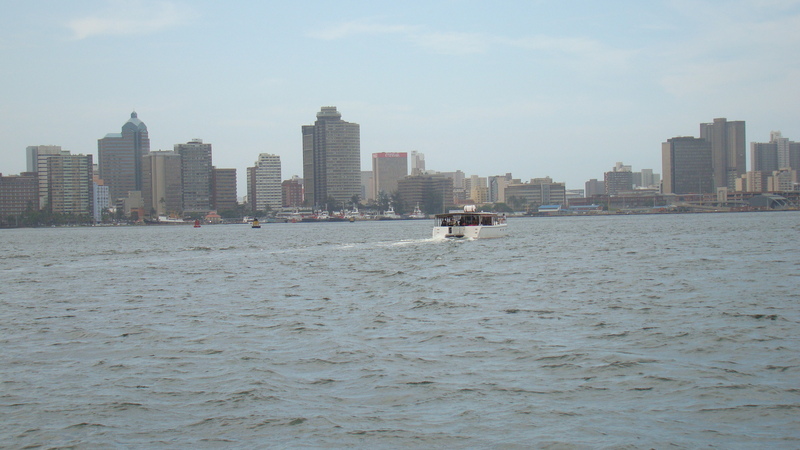 Everyone was ready for the end of year break, and our staff event was to go on a catered cruise on the Durban bay. 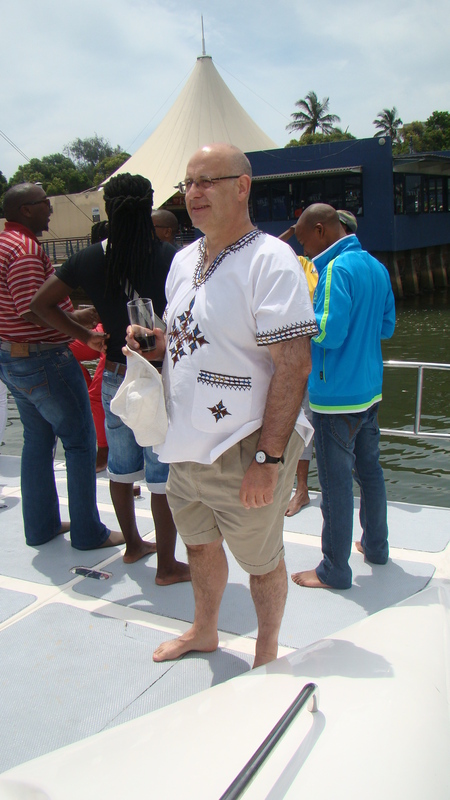 There was a braai (barbeque) on the back of the boat. It was great fun, but unfortunately there was quite a gale blowing which meant we could not go out of the harbor mouth as the swell was too high. There were a total of 41 people on the boat which came as a slight shock because I had not realised the payroll was quite that big. A number are fieldworkers from one of the projects on the outskirts of Pietermaritzburg. Only one person could not make it. Jeremy Poolman, The Road of Bones: A Journey to the Dark Heart of Russia, Simon and Schuster London 2011, 342 pages. This is the story of the Vladmirka Road which stretches through Russia to the bleak expanses of Siberia. It is based on a painting by Isaak Levitan, which is in the front and back covers of the book. Essentially it is a travelogue as the author journeys across the country. There are two interpretations of the road; the one is the bleak picture that Poolman paints of people going into exile at best and travelling to cool captivity and frozen deaths. There is an alternative view which is that the road opened up the country, and allowed commerce and communication. This is never hinted at in this gloomy book. It was given to me for Christmas and I was quite captured by it which is why I continued reading it. Was it worth it, I know a great deal more about Russia and in particular the barbaric excesses of the Stalin era. I love the idea of taking a painting and writing from it. At the end of the day though I think Poolman has a lot more work to do before he is a mature and captivating travel writer stop. He is certainly someone to watch.